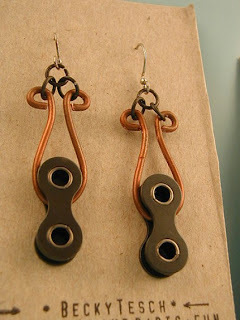 Most bike jewelry involving chain links are very similar in design, like one link hanging down in dangle fashion to form earrings. Now meet Becky Tesch. Her bike jewelry is far from ordinary. 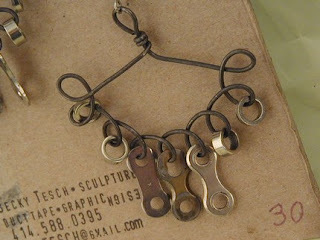 She incorporates wire, links and other bike chain pieces to form some really cool earrings, necklaces and bracelets. Upon first glance you might not even realize that these very stylish pieces are made from used bike parts. I've been admiring the chandelier earrings below for quite some time. They'd be great for a night out on the town. If you're looking for something a little more casual, these copper swirl earrings fit the bill - simple, classy & cool. Thanks for the great blog entry!!! I love the other work posted here too! Dirt Rag magazine would love it if we wrote an article on people who do art with bike parts. I'll head up the effort! Who wants to help me? I'd love to help with the article.